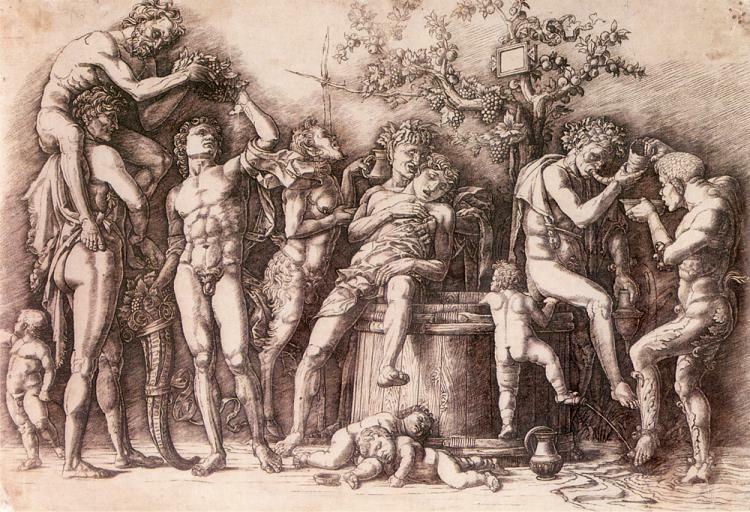 Andrea Mantegna is the brother-in-law of Old Masters Giovanni and Gentile Bellini. He himself is an Old Master and is as skillful and as talented as his brothers. He is one of the best artists of his era and is known for large realistic paintings. He is one of the first real Renaissance artists. Born in Vicenza, Italy in 1431, he was the son of a carpenter, though he was later adopted by Francesco Squarcione. Francesco is an Old Master, one of the best during his time and owned a huge studio, to which he taught numerous students. One might even say that his studio was more like an art school. Out of all 137 students he taught, Andrea was his Obra Maestra. He loved Roman Art and this love he shared with all his students, so much that even Andrea became a fan of Roman Art. Andrea quickly absorbed everything his master taught him. He eventually left Francesco when he was 17 because he believed that Francesco was profiting from his talents without getting any compensation or recognition. He set up his own studio, and in 1453, when he was 22, married Nicolosia Bellini. This marriage proved to be beneficial to both him and his brother-in-laws, whose art was influenced by each other. Before marrying and slightly after he left Francesco’s guardianship, he painted the Santa Sofia church’s altarpiece. He inscribed on it the words: “Andrea Mantegna from Padua, aged 17, painted this with his own hand, 1448.” It showed how proud he was that his talent was recognized despite his age. The year after that he worked on the Ovetari Chapel and painted frescoes of St Peter, St Paul, and St Christopher. He worked there for years, decorating it with beautiful frescoes, like the fresco of St James Led to Martyrdom, where he made use of all the knowledge that he gained from perspective art to Roman architecture details. The frescoes almost didn’t survive the war, when Allied forces bombed Padua in 1944. In 1452 he painted the frescoes over the entrance of the Sant’Antonio Church in Padua. The same year he married Nicolosia, he painted an altarpiece that featured St Luke and other saints for the Santa Giustina Church. Despite marrying the Bellini sister, he did not join the Bellini studio and preferred to pursue his own career in Padua. In 1459 he went to Mantua to work as a court painter, in the service of the Marquis Ludovico Gonzaga. His family eventually moved to the Mantua with him in 1466. Despite having less freedom, he still found time to visit Florence to check on contemporary works from Andrea del Castagno, Donatello, and Fra Filippo Lippi. He painted for the Marquis his best works like the Camera degli Sposi, translated as “Wedding Chamber” for the Palazzo Ducale, Mantua. In this project, he was tasked to decorate the 4 walls and the ceiling. The ceiling is the most brilliant of all the work he did there: it was flat, but because of the work he did it looked like it is a dome rather than a flat ceiling. 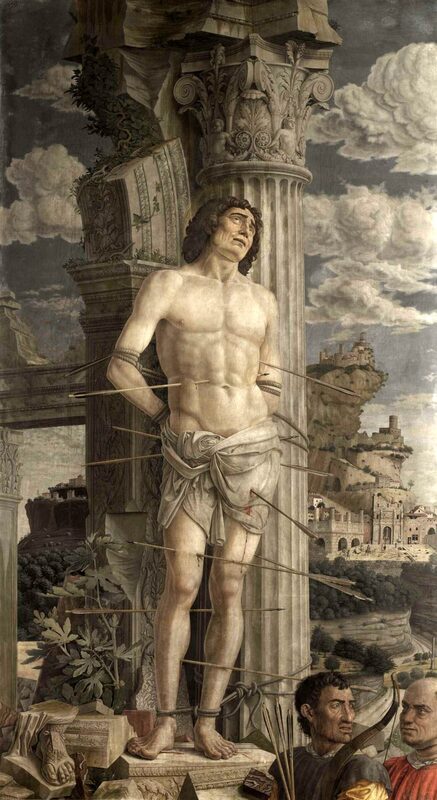 While Mantegna’s work gave him a stable income, his life was burdened with other problems: first, his son, Bernardino, who was expected to inherit his studio. Even with a steady stream of income from the Marquis, he had a lot of money problems that he even begged for help from the powerful Medici family and considered moving to Florence. His son Francesco was banished by a new Marquis from Mantua because Francesco displeased the Marquis. He worked for the Gonzaga family for years, making numerous paintings that were eventually lost, except for the Triumph of Ceasar, a set of 9 paintings that begun in 1486 and finished in 1492. He was also commissioned by Pope Innocent VIII to decorate a chapel in Rome, which was eventually destroyed on the order of Pope Pius VI in 1780. He died in September of 1506. His sons eventually erected a monument for him in 1516, ten years later. The city honored his death and held his funeral in Santa Andrea Church.